Вести.Ru: Top Military Expert! Russia Must Start Stocking Up, Preparing For a Wartime Economy! Top Military Expert! Russia Must Start Stocking Up, Preparing For a Wartime Economy! 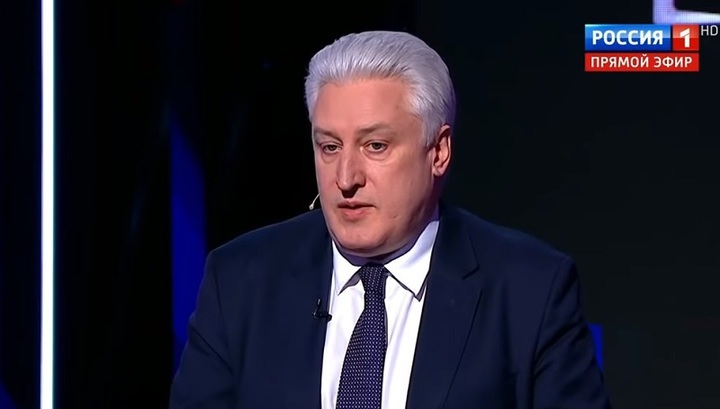 Igor Korotchenko, editor-in-chief of the National Defense journal: The story, that we're discussing and that was broadcast in Germany, on the alleged Russian invasion of Estonia and the prankish and giggling retraction that followed are, in fact, no-nonsense. In essence, this is to prepare the European public opinion for the idea of a war where Russia is an aggressor. And the reaction by the US and NATO is supposed to be as tough and coherent as possible as well as free from any scrutiny or condemnation by the Europeans. Besides, it's a nice illustration of the upcoming meeting with President Putin scheduled for April 18th that Ms. President of Estonia asked for. I mean, this interesting story appeared right after she wanted to meet. - What I want to say is that the propaganda is good, but the best guarantee against a war with Russia is Russia's ability to succeed in such a war, both hot and hybrid. In this respect, I suggest that the priorities of the state armament program be reconsidered, meaning high-precision weapons. I'd like to reiterate that we need to multiply the strategic stocks of sea- and air-launched cruise missiles for several operations. In particular, I mean the Kalibr missiles and the Kh-101/-102 missiles. It's vital to have enough of them for 30, 40, 50, even 6 months of high-intensity war, to create a strategic stock of these cruise missiles. Obviously, Western intelligence will notice that and draw conclusions from it. - Do you mean that, in fact, military plants must work in an almost war-time mode? Because in order to close the gap in the quantity, not the quality, of the weapons that we have now, extra capacities are needed. - No, but we must be ready for another war. - But now we have no time for preparation. We won't have the option that Stalin had when he could buy time by moving far inland and making steady resistance. There's no time in a next-generation war. There won't be any time to build factories during nuclear attacks. - You've made a good point. By the way, the Chief of the Russian General Staff, Valery Gerasimov, has made it clear that our military-industrial complex won't enjoy a mobilization period in a new war. That's why the mobilization reserve of new, high-precision weapons should be created now. We need to multiply the production of air-defense systems. Again, we're discussing scenarios for any war, but it's crucial to give cover to facilities. That's why we need to multiply the production of Tor-M2 air-defense systems and to put them on combat alert to cover key military and civilian administrative facilities. As for the Arctic, the Tor-M2 DT is already being supplied to the army, but this supply should be increased. Any army is fully functional in any war if it has two components: firstly, the leadership's willpower to authorize the use of forces; secondly, new weapons; thirdly, the ability of the armed forces to repel the threat quickly and effectively. As long as our army has all the three components, there won't be a war, just jumpscares and bogeymen, but no one will dare to start one. Moreover, Russia always has its strategic nuclear shield behind its back. - They want a war, but it has different levels. I mean, what Igor is speaking about bars them from strategic wars, let's put it so. Excuse me for my inaccuracy in military terms. But it doesn't bar them from local military conflicts, in particular, from the south. We need to consider the American's attempt to ally with the Taliban. Clearly, they'll try to split our forces. - High-precision weaponry is the pillar of modern warfare. Thus, the ability of the Russian Armed Forces to use high-precision weapons with conventional equipment must be comparable to the capacities of our closest opponents from NATO. This is obvious. By the same token, before a nuclear exchange phase — we hope the world won't see this phase — the protection of key administrative and industrial infrastructure is the core of aerospace defense. To put it simply, it's crucial for us to ensure our digital sovereignty in the upcoming decade. By the way, it's closely connected to Mr. Shakhnazarov's statement. Such a device is a means of direct communication with those who diffuse information with any ordinary citizens, including those in the Russian Federation. We need to do our best to hamper the fifth column in Russia: externally funded forces. In this respect, the relevant FSB functionality must be extended now. - Wait, wait, wait. The Cheka, camps, executions. - I, again, no... Vladimir Rudolfovich, no, give me a second! I mean, cutting the financing of opposition movements in Russia, political groups in Russia, with Western funds and Western influence. - Yes, using Western funds to finance the Russian political system.